Fred Olsens Black Watch is a sleek and intimate vessel, harking back to the days when cruise ships were once revered for their style and charm. There is plenty to enjoy on-board, the Neptune Lounge offers entertaining cabaret shows, whilst the very British Morning Light Pub provides live entertainment, you can also admire panoramic views across the ocean in the Observatory Lounge. The ship offers tantalising freshly prepared dishes in the Glentanar restaurant, the Braemar Garden Cafe is a perfect place to enjoy a lunchtime snack, or there is the Grill open in the warm weather with dining over the tranquil views of the ocean. The ship also has a choice of swimming pools, a Jacuzzi, a fitness centre, salon and spa! 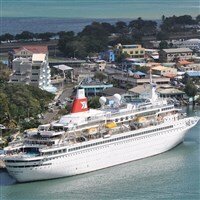 All our Fred Olsen Cruises include a Door to Door Home collection, on-ship gratuities and an All Inclusive package. Experience captivating, unspoilt and spellbinding scenery and enchanting attractions of the spectacular Shetland, Orkney & Faroe islands! From start to finish, your exploration of scenic Scotland will be an adventure to remember! You will call at Greenock, enjoy a day to explore Loch Lomond, go by Duart Castle, see elegant Victorian houses and the impressive Munro Mountains. Take in Tobermory on the Isle of Mull and search for seals and dolphins on the Sound of Mull! This tour has it all!